"Religion to me is almost like when God leaves - and people devise a set of rules to fill the space." Oh Christian sub-culture. I recently read a book entitled "The Christian Culture Survival Guide." It was quite humorous. However, it was also quite shameful. The sad part of the whole book was that 1) I got all the jokes and 2) they didn't always paint Christians in a positive light. As someone who can easily be grouped in with the Christian sub-culture, I have long stated, along with many others, that Christianity is not a religion, but a relationship. I would argue vehemently with others that I am not religious. Unfortunately, I must now say that I am guilty as charged. There is a definite relationship there, and the whole thing that God and I have going on goes way beyond a set of norms and rules. But... on top of that raw grace relationship, I have piled norms and rules. I have judged others based on how they fit the cookie-cutter mold that I always thought was Christianity. There are things that I have done or not done based on what Christianity, and not necessarily the Bible, says is appropriate. I am not a Christian. I am a human, first and foremost, just like every other human. I have hope because of this profound thing called grace, which is available to every other human. The implications of accepting this grace has had vast consequences in my life (which I can blog about at another time). But, as the very essence of my being, I am simply a human, like everyone else. One pet peeve that I have long had with "Christian" music is that it just doesn't seem real. Music should capture the struggle between reality and faith, and I often find that Christian music focusses way too much on the faith. There is nothing wrong with this... just for the record. But, if you read any of the Psalms, David balanced his real struggles with faith that God would take him out of them. Many people have accused bands like Switchfoot and U2 of "selling out." I think it's the opposite... Switchfoot and U2 capture real life in their art. It is a balance of being human and experiencing grace. We can relate better to it because it's real. These thoughts may seem random, but I'll sum them up here... Speaking to those who identify with the Christian sub-culture: Let's be relevant. We are not special or different; we are human. The only difference between us and those who don't identify with our sub-culture is a grace which is available to all. Speaking to those who don't identify with the sub-culture: Don't let something that smells an awful lot like religion prevent you from investigating a grace that could radically alter your life. And just a final disclaimer... it may seem like I'm down on the church, but I'm not. I'm just in the process of investigating where the value and the damage lie in organized Christianity. More importantly, Bono captured a lot of things that were on my heart and put words to them. I am so thankful that someone with such influence and eloquence cares so passionately for social justice. "'Love thy neighbour' is not advice; it's a command." The question becomes "who is my neighbour?" Remember in Luke 10 when an expert of the law asked Jesus that very question? I think we can easily surmise that our neighbour becomes anyone, whether they live next door or across the world. Today we live in a world with a Holocaust of Hunger. If we don't care, if we don't do anything, we are contributing to the problem. There are only two sides: fight "stupid poverty" (that which "sees a child die of hunger in an age of plenty," that which is completely preventable) or encourage it. By doing nothing, we are part of the problem. If I do nothing to fight poverty, I am guilty for the deaths of AIDS-afflicted orphans and hungry widows. So what can we do? Well, my apologies to all the skeptics, but I'm going to reference Bill Hybels. First of all, we need to be educated about the problems out there. Then we need to do SOMETHING to alleviate human suffering. Lately, I've had several opportunities to enjoy the sun setting. What is it about sunsets that is so exquisite? I feel like it has to be more than the brilliant display of colour. 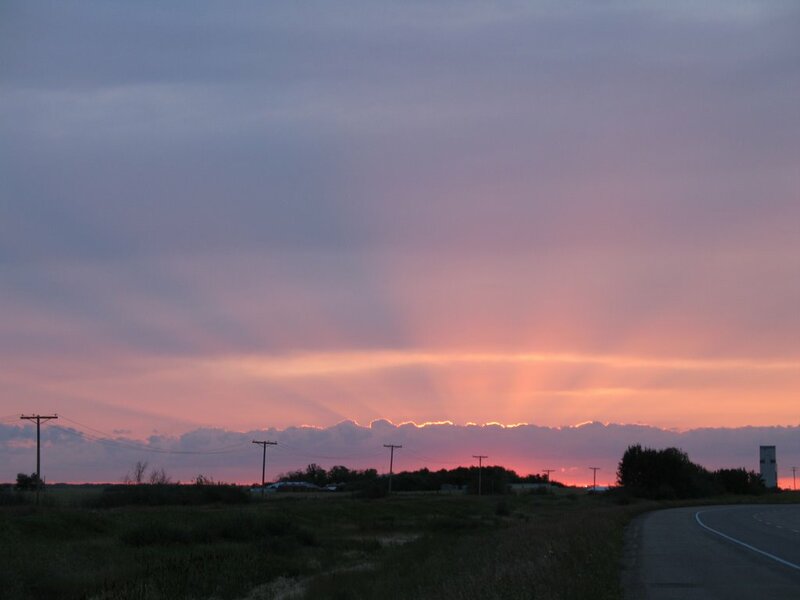 Last week, we were driving through Saskatchewan and after watching the sun set in my rear view mirror, I pulled over to the side of the road so I could just take it in (and capture it on virtual film). The sun was actually hidden behind a large cloud and beams of light shot out from behind the cloud while the whole sky (and you can see the whole sky in Saskatchewan!) filled with rich crimson and violet hues. Last night I had another opportunity to take in the sunset. It was raining, but the sun still appeared in the West, complete with exquisite colour. So why are they so amazing? There's something more than the colour, because flowers are pretty colours, too, but I don't pull up a chair and sit to watch them for a long time. Perhaps it is that I appreciate so much that God chose to make something that is so routine breathtaking. Every single day the sun sets... Yet many evenings it becomes this incredible show. Another thing about sunsets is that they are a prairie treat. The mountains and their splendour are 4 hours away. The ocean is at least 12. Many other places have great scenery, but nothing hosts a sunset like the flat horizon of the Prairies. Symbolically, sunsets are a reminder that today and it's troubles are done. A new day is coming. For good days, sunsets serve as a brilliant finale. Either way, they hold hope for the new day that is coming.